Chalo is a simplistic movie about a simplistic goofball told in a simplistic way peppered with some simplistic jokes, and we'll simply stop saying the word simplistic so many times as even our simplistic brains understand that you simply can't take this anymore. Writer/director Venku Kudumula introduces you to Chalo's simplistic protagonist Hari (Naga Shourya) by doubling down on the latter's singular character trait; Hari loves fights. He loves getting into fisticuffs so much so that he doesn't mind being on both the giving and receiving ends of physical punishment. Inspired by old man Rajinikanth's parenting techniques from Arunachalam, Hari's father decides to ship his son off to Tirupuram - a rural town which has the border between Tamil Nadu and Andhra Pradesh running right through it. Because of the town's unique makeup, it is a haven for violent communal disputes between the Tamil and Telugu contingents. Hari's father wants his only son to get into as many fights as humanly possible in this volatile environment as he hopes that it would help create a dislike of said violent lifestyle in his son's mind. Why he can't have his son learn a martial art and represent India in the Olympics or in the Octagon? I don't know the answer to that question - and neither do his dad and nor the movie. After the aforementioned setup, the movie's plot follows Hari's attempts at trying to unite the two sections of the town as he, the Telugu guy, falls in love with Karthika (Rashmika Mandanna), the Tamil girl. Chalo is a veritable smorgasbord of self-deprecating humour, inane setups, hilarious payoffs and lazy braindead storytelling at its finest. It looks at its audience, smirks, and says, "If I'm going to be stupid, I'll be KING STUPID." And runs with that statement from minute 1 to minute 135. And to its credit, I haven't laughed out loud at a Telugu movie to this extent since Pelli Choopulu. Many a big-budget star-powered Telugu movie needs to take a look at Chalo for a few pointers to how to use a wafer-thin plot and a wealth of character actors to its advantage. The movie masks its deficiencies in the logic and story departments by having its characters laugh at its glaring flaws which in turn gives the audiences free reign to enjoy themselves at the movie's expense. The film is so self-aware that it drags out specific plot points (mysteries) to a comical degree while priming the audiences not to expect much from the ultimate payoff. It is a risky act to pull off, and the movie almost comes off scot-free but for a few errors in some key areas. Chalo's primary drawback is its lead couple. Naga Shourya and Rashmika Mandanna might look the parts at being your everyday couple next door, but they can do precious little in terms of getting an audience to sympathize or empathize with their plights. Naga Shourya's inexperience comes through when he is forced to emote non-verbally, and Rashmika Mandanna's Karthika seems to be a clear rip-off of her character from her Kannada debut in Kirik Party (right down to her glasses). However, unlike her male counterpart, Mandanna drops the ball with her verbal acting whereas her quieter moments offer more in terms of making her character likeable. The awkward line-readings and unsubtle emoting while spouting out said lines don't help her make a strong Tollywood debut. But credit where credit is due, as the movie redeems itself by getting the most out of the talents of its character and comedy actor brigade. These men and women have not been given material this good since Srinu Vaitla's heyday, and they do make hay within these two and half hours of sunshine. Satya, Posani Krishna Murali and especially Venella Kishore bring their unique brands of physical comedy, comic timing and dialogue delivery to their characters. These actors and their quirk-fuelled characters are so engaging that you'd be asking for spin-offs with them in the lead while simultaneously forgetting about how bang average the score, music and sound design are. While the actors go above the call of the duty to help the audiences get their money's worth, the film's technical staff seem to have put themselves on autopilot. Every tender scene between boy and girl is shot with soft focus and every scene with a bad guy is rendered with an uncomfortable close-up. These shot choices reek of overuse. And when the movie tries to break convention, it rips off shots from Kingsman hoping no one will notice. In all honesty, however, not many in the audiences seemed to be noticing the flaws that seemed so glaring to us, as they were too busy laughing their ribs off. It's like the movie knew it had unlikable leads, a hackneyed storyline which was the unholy love child of Brindavanam, Maryada Ramanna and Ready, and some lapses in logic so blatant that the theory of creationism seemed plausible by comparison. However, unlike many a commercial movie, it never tries to talk down to you from its flawed moral high ground. On the contrary, it sits next to you, accepts your flaws as a nitpicky moviegoer and invites you to accept its flaws as it is nothing more than a pure popcorn entertainer. Man o man, all political correctness aside, this movie was hilarious. I agree with everything in the review except for the rating. Sure, from a film analyst / critic's point of view, it deserves a 6, but from a common movie goer's point of view I would say it's an 8 or 9, maybe even a 10. It's pure unadulterated entertainment designed to keep you engaged. Satya was a riot, and so was Rashmika. 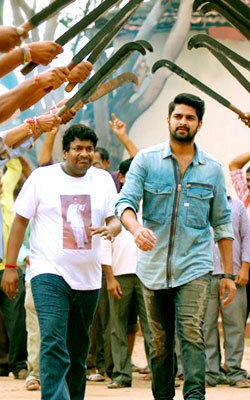 Naga Shourya is a lovable guy, and he lived up to it. I can't believe the other reviews (read biased websites) bashed it so much! Oh, yeah, I also strongly disagree with the leads being unlikeable. They are very beautiful people, and both of them can actually emote. Lower your standards, TJ - I am sure you are a very handsome man (read in a light tone). Definitely would recommend if you love peak V V Vinayak and Srinu Vaitla type entertainment. I do understand that TCMG. But I have to weigh in every aspect and see if the whole is better than the sum of its parts. Even though I've always maintained an opinion that a "score" is reductive, I have to keep my opinion honest. The simple fact is, I haven't thought much about Chalo since I saw it on the day. It hasn't stayed with me even as a comedy. But, it was great fun as long as it lasted. I felt the PC police needed to take a chill pill with this because the film mocks its own non-PCness. The final reveal is a slap in the face of how ridiculous every single one of our communal disputes is. The film is more self-aware than people give it credit for. The film actually plays with the fact the fact that its leads are complete self-serving dicks and not much else. I love the self-awareness there too. But the fact is Rashmika is still quite green as an actress and the troupe of comic talent around Naga Shourya help his performance to a high degree. When they aren't around him, he isn't as engaging. I agree with you on the last point there and I did mention it in the review too. This was what Srinu Vaitla used to offer up in spades before his films started repeating themselves. It is pure mindless, self-aware enjoyment. A lot of comedies nowadays try too hard to be funny. This one has its tone just right. I'm keeping an eye out for this director's upcoming projects. Unlikeable leads???? Something very fishy here. I am done with this site now. As much as I hate being snarky., Your handle suggests as much even before the comment. So you arw telling me that it is not satya but shakalaka shankar who brought fun in the movie. Says a lot about your telugu movie knowledge. If you are looking for 10-15 extremely well penned punchlines, look no further. If you are looking for 2.5 hours of unadulterated entertainment, look elsewhere. If you are looking for a really well made movie, keep looking! It’s Romeo and Juliet alright; set in a village named Tiruppuram, through which runs a border dividing Andhra and Tamilnadu. The Telugu and Tamil folks are at loggerheads with each other thanks to some age-old feud. The students from both groups however go to the same college which is supposedly a neutral ground. What happens when a Telugu guy and Tamil girl fall in love and their respective groups want to kill each other? The movie tries to ask and answer the said question. However, I have a few questions myself???? When will we get over regional feelings? Why do moviemakers think it’s funny to refer to the color of a person based on a state? Why do they make fun of a person’s color/weight at all? Why can’t most of the cast including the protagonist do not seem like they could still be college going kids? Why can’t the lead pair convince me that they are in love? Why is Vennela Kishore’s revenge fantasy more entertaining than almost everything in the movie? Why does the story writer think that having a few really funny punchlines is enough to make a good movie? Please let me know if you can find the answers to these questions! fullhyd.com has 700,000+ monthly visits. Tell Hyderabad what you feel about Chalo!